Based in Epsom, Surrey, we are a Mother/Daughter team, providing professional event decoration for Weddings, Parties, and Corporate Events, large and small, all over Surrey. We can provide anything from just a few balloons, to complete venue decoration. Having been in the party/event decorating business for the past 8 years, we have decorated the venues for over 1500 Weddings, Parties and Corporate Events, both large and small. We are very proud of the good reputation we have built with both our customers, and the function managers at some of the area's most prestigious venues. Many of these venues now recommend us as their preferred suppliers. Please visit our customer comments page to see what our customers have to say about us. With our City & Guilds, and Certified Balloon Artist (CBA) qualifications in balloon decoration, along with our membership of The Qualatex Balloon Network (QBN) and The Balloon And Party Industry Alliance (BAPIA), you can be assured of a professional job. We hold the full public liability insurance which many venues now insist upon, allowing us to use our pressurised helium tanks and inflation equipment on their premises. All photos on our website have been taken by us, and show work carried out only by us. We do not use photos of work carried out by other venue decorators, or use stock photos from balloon manufacturers' catalogues or portfolios. Our availability is often booked out months, even years in advance for popular dates, so please email us to avoid disappointment. 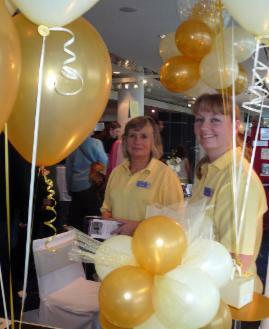 We look forward to working with you to ensure your forthcoming event, however large or small, is a resounding success.